Notes: This tutorial will cover how to setup and FTP Server using Filezilla Server under a windows environment. I Recomend the use of windows XP because it will run on most older systems and it's perfect to use on a 5-10 PC Network OR an Internet FTP Server (When setup with the proper firewall and Antivirus,i will explain this). FTP Stands for File Transfer Protocol so basically it's a set standard of rules for transferring data between computers,wether in a network situation or over the internet. Windows Shares/Samba shares are good when you just want to share files in a network,in a certain workgroup. Though what if you wish to share files over the internet? Or to devices that aren't in your workgroup? With FTP,your files are accessed through an FTP Client which accesses your server through an IP Adress which makes sharing files simple. It's also fantastic to use when you use multiple Operating systems! 1. First decide wether or not you will want to use your files over the internet. If the answer is YES,Please download a proper firewall. If not,skip to section 3. 2. Download and install your firewall. You will need to configure it to allow traffic over Port 21 both in and out! 5. 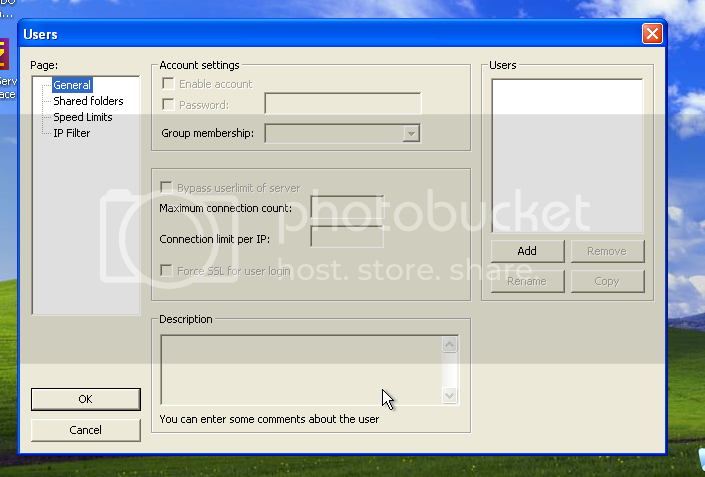 Now click add and type the name of the first group,in this case we will create an admin group,so call it 'admin'. 9. Now that the server is running and a basic admin usergroup and user account has been created,put some files into the data folder we created. XP: Start>Control panel>Network Connections> Right click onto the network interface your server will be using and click properties. Highlight 'Internet Protcol (tcp/ip)' and click on properties,now simply enter a Static IP,Gateway IP and The DNS IP. Vista/7: Start>Control Panel>Network and sharing center>Change Adapter Settings>Right click onto the network interface your server will be using and click properties. Highlight 'Internet Protcol Version 4 (tcp/ipv4)' and click on properties,now simply enter a Static IP,Gateway IP and The DNS IP. Now take note of the IP Adress you set! 11. Now the server has a basic Server config,go ahead and try the FTP Server from another PC on the network,simply open the FTP Client of your choice (I Recomend WinSCP) and use the IP Adress you set,port 21 and the admin username (And a password if you set one!) to log in. You should now be logged in! Now if you only wanted to share your info over our network,you are done! 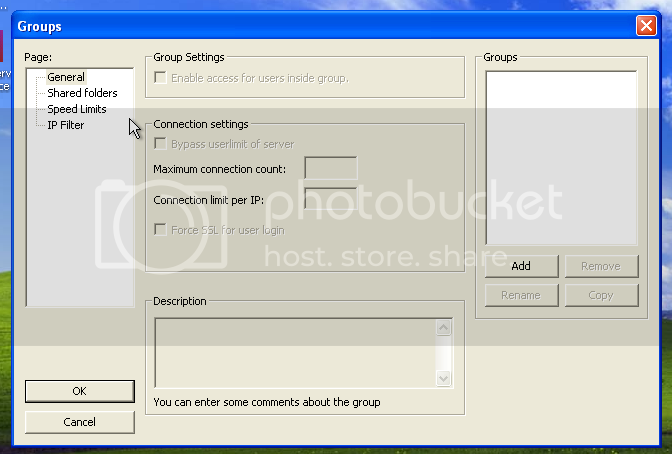 Go back and add more Users and Groups if you wish and your files to the data folder! If you wish to share your files over the internet you are going to have to Forward Port 21 (Or DMZ The Server),for more info visit this site. *: I Strongly Recomend password protecting the admin account! ': More info on how to change to a static IP Here. 2. Does not require passive IP response on the FTP server. 3. More secure since only subsequent ports are allowed instead of the entire passive range.